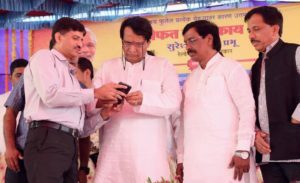 Wi-fi facility at 28 railway stations of Konkan Railways has started functioning. Railways has collaborated with two private companies to provide 2 Mbps peer to peer 24 hours free Wi-Fi internet bandwidth. Unlimited free Wi-Fi facility will be provided at 28 stations from Kolar to Madure in the initial phase. The system can provide access to about 300 users at bigger stations and about 100 users at smaller stations. This facility will help travelling public, commutes & tourists on Indian Railways to access essential information and they could use their time productively while waiting for trains at railway stations. This initiative of corporation is a steps towards making a smarter India. This facility will help travelling public, commutes and tourists on Indian Railways to access essential information and they could use their time productively while waiting for trains at railway stations.